It is with sadness that we note that Arnan Gabrieli has passed away. 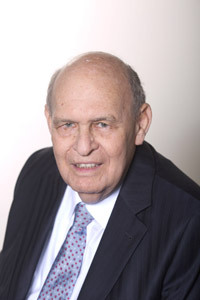 Arnan Gavrieli was a founding partner and then Senior Partner of Seligsohn et Gavrieli, now Seligsohn Gabrieli & Co. . During a career that spanned over 50 years, he advised and litigated all types of intellectual property law and was party to many of the most significant intellectual property cases argued before the Israeli courts and the Registrar of Patents. He represented clients in trademark and copyright infringement cases, as well as passing-off, trade dress and trade secret cases. Arnan Gabrieli was a member of legislative committees which drafted important Israeli IP laws. He was Chairperson of the Ethics Committee of the Israel Bar and of the Complaints Against Patent Attorneys Committee. He also lectured in IP Law in Tel Aviv University and at the College of Management, Faculty of Law. During the years 1980 to 1987 he served as Editor-in-Chief of “Hapraklit”, Israel Bar Quarterly Review. He was also a previous Chairperson of the Israel branch of the AIPPI. Arnan Gavrieli is mourned by his sons Nachum and Udi Gavrieli who practice IP Law with the firm. Arnan was a registered Patent attorney despite not having a science or engineering degree. He was working in the field prior to 1967 when the Israel Patent Law 1967 was legislated and was ‘grandfathered’ in at the outset. I served the second year of my qualifying as a patent attorney at Seligsohn et Gavrieli, and then, until in 2004 when I set up my own firm, I effectively ran the Patent Department under the nominal head, Mr Alfred Thee, who was then working part-time, and I believe still is. I am grateful to Arnan for employing me and for the training I received there.